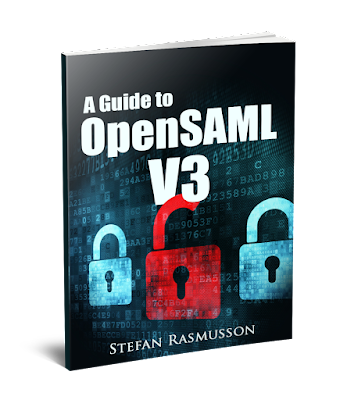 SAML Security: OpenSAML book released! After many late nights and tedious editing, I have finished my book on OpenSAML, based on my experiences working with the OpenSAML library. A Guide to OpenSAML is a short book that introduces SAML, the SAML Web Browser Profile and the use of OpenSAML. The book has three parts, the first of which introduces SAML, SAML Web Browser Profile and OpenSAML. The next part goes deeper into explaining the Web Browser Profile more in detail and shows how to implement it using OpenSAML. The last part explains how to use some of the security functions in OpenSAML, like signatures and encryption. The book explains the interaction from the Service Provider’s point of view. The implementation of the Identity Provider is not covered in this book. The package contains the book in PDF format, three different e-reader formats(EPUB, MOBI, AZW3) and a sample project showing OpenSAML in action. How will I get download link after paying with PayPal ? I have already payed and didn't got any download link. What email did tou use for paying? How do I get the invoice of my purchase? If you send me your email to stefan.rasmusson.as@gmail.com and we'll fix that. I purchased your book, but I am struggling to generate the metadata, and that doesn't seem to be covered in the book. I am struggling with the key generation, can you use the same jks used to sign the authnrequests, etc or is this separate. I saw you post about metadata generation, but it looks like your are generating the key on the fly. Any pointers on how to generate and can I securely use the same keystore used to sign requests? If so, how do I generate the metadata keys from the keystore? Thanks! in the post I am not generating the Key on the fly, I'm generating the KeyInfo element that is coing to contain the key. As you see on the line 12, keyInfoGenerator.generate takes a X509Credential. You can read this credential from a keystore of you choise. More information on getting credentials from a key store see http://blog.samlsecurity.com/2011/03/getting-credentials-in-opensaml.html. I wanted to purchase a copy of your book, but I see a "This product is not currently for sale" on the Gumroad site. Thanks, will check back on the book in the new year. Happy holidays! OpenSAML is a prime example of how important it is to document your lib projects, unless you want to make them inaccessible :) We maintain a Java SDK for OAuth/OpenID Connect and wanted to add support for SAML 2.0 assertion grants. There seems to be a newer OpenSAML 3.x version, but its documentation is even poorer, so we went along with 2.x. Do you have any comments about 3.x and whether it's worth upgrading to it? I fully agree. I have not read up on what the latest version has brought to the table, but I'm sad to here that the documentation is still bad. Seems like the book is still not available. May I know when we can purchase this ? Thanks Stefan. Can see it now. Hi Stefan, I've been working on a SAML implementation for ~6 weeks now. I bought your book and looked over your example app. Both have been extremely helpful!!! Thank you! But something that is not in the book and I think should be is Logout. Can you point me to some good examples/documentation for logout? In code singleSignOnServlet.java line 28, SAMLart value is hard coded. But at page 29 of sstc-saml-binding-errata-2.0-wd-06.pd 3.6.3.3 Form Encoding and 3.6.4 Artifact Format, artifact format is specified. Can you explain in book what are inputs for generating SAMLart value as AAQAAMFbLinlXaCM%2BFIxiDwGOLAy2T71gbpO7ZhNzAgEANlB90ECfpNEVLg%3D? Hi Stephan, I just bought your book and it is helping me a lot, thanks for that. I have some doubts about encryption phase. I am coding a servlet who makes a SAML request to an OIF IdP. I could make it work, over plain text with signing. However, I am not having luck encrypting both request and response. I am trying to understand your encryption code (page 41), does it belongs to an SP or an IdP? The examples in the book are for encrypting the assertion at the IDP side but I dont think it should be much different using it on the SP side. Is the encryption failing or does the OIF have problem decryption? Is there a way to order the book from Canada? The payment fails verification since I don't have a valid ZIP code to enter! I want to create an SOAP service which will have authentication via ADP is this part covered in the book ? Also which programming language is examples are in ? Is this a web service? This is not specifically covered in the book. The book does however cover general use of OpenSAML. If you are going to build a web service with OpenSAML I still thing you would have use of the book. The examples are in Java. Thanks for the reply :), Yes it is a web service. Specifically SOAP web service. Would be great if you can point to any article you wrote about web service with IDP. You should be able to click the PayPal icon up on the right corner to pay with PayPal. Have you tried that? Hi Stefan nice to meet you. I have a client who needs a java EE web application authenticated against his ADFS using SAML. However , there is no need to use SSO. I am a Java programmer , but totally new with this let's say 'SAML world'. Do you think your book could support me the whole implementation process ? IN case I have some questions , even after reading the book , could I contact you ? Thank you!! Sorry for the late answer. My book details how OpenSAML works, but it also explain how SAML works in broad strokes. I think you could have use of my book. If you have any questions you are free to ask them. I will answer when I have the time. I bought the book and it is really good for providing information on how to actually implement SAML using OpenSAML. All the examples use HttpServlet. I do not have HttpServlet in my application and I was hoping you could point me in the right direction for using OpenSAML without HttpServlet. Lots of funktions are based on HTTPRequest and HTTPRespons. What do you use for web traffic in your application? I am suffering (too many failure) to decode SAML Response using OpenSAML Java Library. so I've bought this book, but it only talk about SSO profile with POST/Artificat Binding. why it doesn't contain information about Redirect/Post Binding ? where I can find a complete working example ? I live in Japan. I tried to buy this book but I couldn't because paypal error occured. "Paypal Error This Paypal account is restricted. This message means that your PayPal account is restricted, and you need to remove the restrictions to accept payments. This can be resolved if you login to your Paypal account and follow the relevant instructions. Or by contacting your PayPal account manager for resolution." I registered paypal account in Japan and tried again but I couldnt. I tried to create paypal account in the US but I don't have social security number so I cant register. How can I buy this book? Recently my company started using a new authentication architecture, I must connect my web application to company ADFS using SAML2.0, is this book helpful to my situation?